Having extensively learned trick training on Kili and Duke, I think I will be able to train the Cape more quickly and efficiently. At the same time, I would like to experiment with alternative training methods like modeling, empowerment, and differential reinforcement. I am going to make the strongest possible effort to do all training through positive reinforcement and avoid resorting to flooding, negative reinforcement, or punishment. I do know that these methods can be effective but I am curious to accept the challenge of trying to train without them. Here is a progress update about the upcoming Cape Parrot. Originally I was supposed to get the older of the two babies. Jean expected the older one to end up bigger because it was born from a larger set of wild caught parents. However, as time progressed, it turned out that the younger baby not only caught up but grew bigger than the older one. The younger Cape comes from a domestic pair named Angie and Magnum. Jean said this baby not only turned out larger but also has a sweeter disposition. The older is now 295g but the younger is 315g. They are somewhere from one to two weeks apart. Jean has done the same extensive efforts with both parrots and I am currently the only paid buyer so I have the option of choosing either one. She taught both parrots to drink from a water bottle, eat the same pellets, and to wear an aviator harness. So based on everything Jean advised, as well as all the good things I've heard from someone else that bought a Cape Baby from the same breeding pair, I decided to go with the younger/larger Cape. This Friday, Jean will be taking the Cape to her vet on my behalf. I asked her to get the vet checks for me because she has a very good vet and I don't like the one I worked with in my area. If the parrot checks out healthy before being shipped, I don't really see any need in duplicating the check afterwards. The visual inspection the vet did when I bought Kili I can so easily do myself now at this point. I'm quite confident in Jean as a breeder so the vet check is only precautionary. 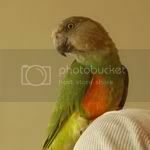 The vet will also take care of some final grooming and place an open band on the parrot's left (non-dominant) foot. Pending all results being good from the vet check, Jean should be shipping the Cape Parrot to me early Tuesday morning to avoid the Florida heat. Thursday is the back up day. "Provide occasional foraging opportunities in/out of cage" Why are you only providing occasional foraging opportunities? Usually people stress how important foraging is for parrots. [quote="Kim S":bc953ioz]Teach target training through modeling rather than trial/error if possible[/i:bc953ioz] The usual trial/error would be waiting till the parrot touches the target and then click/reinforce. And not doing so when it 'misses' the target. How do you model? [/quote:bc953ioz] You got it exactly right. Modeling would be where I leave the Cape in cage but in sight and let it watch me target Kili. Then I put Kili away and take Cape out and target it. Hopefully, if modeling works, it will grasp the concept and target without greater training effort. I will test this out to the greatest extent. If the Cape makes extensive efforts to walk over to the target stick off the first sight of it, then it was clearly modeling. If it's easier than normal to teach target but still using trial/error then modeling assisted but it still had to be taught. If modeling works well for target training, I will try to see how many other tricks I can teach simply by modeling. Basically the big difference between modeling and trial/error method is that the parrot would attempt to do the trick from the first attempt whereas trial/error doesn't work until it so happens to try the behavior for the first time. [quote="Kim S":bc953ioz]Develop safe petting cue and method[/i:bc953ioz] You're attaching a cue to 'petting time'? LIke: 'want a scratch?' and then it can expect a scratch? Or am I thinking the wrong way completely? (feeling rather blond right now)[/quote:bc953ioz] You are thinking exactly right. There is a pseudo cue with Kili and I'd say this is true for most household parrots. If you pet the parrot the same way every time, your parrot can see it coming from your body language. However, with the Cape (being such a big parrot and big beak), I'd like to create a definite offer cue and a response from the parrot. So if I wiggle my fingers in preparation to scratch, if it accepts it will bend head down or otherwise reject. This is a form of empowerment that reduces aggression and prevents bites. This isn't so much for me as it is for other people that might want to handle the parrot and the benefit of my viewers. I've pet Kili whether she wanted to or not and at most she'd nip to state her opinion. However, other people have gotten bit for trying to pet her when she didn't want it. So instead, I'd like to create a very definite way of doing it. [quote="MandyG":bc953ioz]"Provide occasional foraging opportunities in/out of cage" Why are you only providing occasional foraging opportunities? Usually people stress how important foraging is for parrots. [/quote:bc953ioz] The reason I only do occasional foraging is because I do a lot of training. The way I do things, training is the parrots foraging opportunity. Rather than digging/breaking treats out of some place, it has to shake its head or turn around, etc. I think it exercises much of the same brain systems as foraging and is in fact an accelerated challenge. For people who don't work with their parrots, foraging opportunities are an alternative (and possibly more natural) substitute. I don't want to encourage my parrot to look for treats on its own too much. I'd rather it look to me as a provider of treats. So the foraging opportunities are more for when I'm busy or as a supplement to training. Wow Michael, you will surely be busy! I'm confident you will manage it fine. Have there been many success stories with modelling or is it something new that you have thought to try? I've heard of it used as the primary method of teaching in the Alex studies. Otherwise, not so common in parrot trick training. The reason being that it's not easy for them to model from watching us cause our limbs work differently. It's not particularly practical to use modeling other parrots for trick training unless you're trying to reteach a trick from one parrot to many because the first parrot still has to learn the tricks using the long trial/error method. I'm just curious to see how modeling works out and to see if I can create a methodology that allows me to teach behaviors by modeling from Kili in the future. Basically I want the parrot to learn how to learn by watching Kili do it. Well I'm going to do all the flight training as though we're going to do outdoor freeflight. I will have to see how that goes and gauge our relationship/reliability before actually attempting it. Even if I never do outdoor freeflight, those skills may someday come in handy if the parrot ever gets out. I think your goals sound great. your going to freeflight outside??? or did i read your post wrong???? I said train toward outdoor freeflight. I'm doing the same with Kili. This doesn't mean I will outdoor freefly either parrot but I want them to be proficient and reliably enough that I would feel comfortable getting them back if they got out of the house or off the harness. If someday I find that the birds are well trained enough for outdoor freeflight, I might consider it. As of now though, I definitely don't think Kili is reliable enough for it. However, the Cape being never clipped might have a better chance but we'll see. It's just icing on the cake and I won't be too disappointed if it never happens. Warning, outdoor freeflight is a very risky business, please do not attempt it on your own.